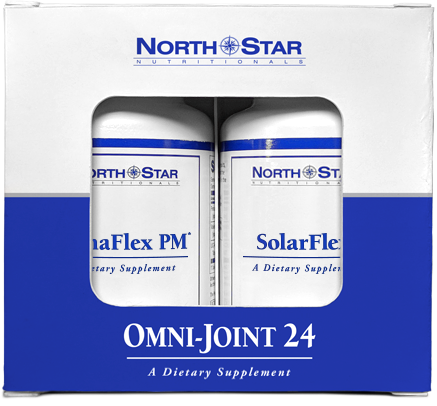 Introducing Omni-Joint 24, NorthStar Nutritionals’ first ever around-the-clock solution for pain-free joints 24-hours a day. Dr. Spreen’s cutting-edge formula resets your natural “body clock”, targeting joint pain during the day and night… giving you 24-hour total relief and comfort. Dr. Spreen has made it easy to transform worn-out, overworked joints into virtually brand-new joints with his exclusive “day mode” and “night mode” support, so you can spend your golden years loose, limber, and pain-free. With Omni-Joint 24, you get two powerful, unique joint formulas – SolarFlex for daytime support and LunaFlex PM for nighttime support – keeping you pain-free 24-hours a day. And it’s as easy and as simple as a snap of your fingers! You’ll feel your pain VANISH into thin air. And it’s all thanks to a brand-new scientific discovery that helps reset your natural “body clock”. Starting as early as TONIGHT. This is 24-hour all-day, all-night total comfort and relief. You’ll easily bend, crouch, reach, and twist all day long without cringing in discomfort. Without those sore and achy joints that keep you tossing and turning all night. In fact, this breakthrough has been shown in scientific trials to be 240% MORE EFFECTIVE than other leading joint treatments. I know this all sounds like science fiction… but as you’ll see, it’s very real. And for those of us with joint troubles, it’s an absolute Godsend. Because the sooner you find out how to reset your “body clock”, the quicker you’ll be on the FAST TRACK to living a pain-free life 24 hours a day. You can do two, three, four, or MORE activities in the same day. Pain will no longer be holding you back from living your life to the fullest when you have 24-hour comfort, relief, and support around the clock. My name is Dr. Allan Spreen, and I’m Chief Medical Advisor for NorthStar Nutritionals. Especially since I’m 68 years young and no stranger to stiff, painful joints myself. That’s why I’m telling everyone I know about this remarkable scientifically-backed discovery. Because as a medical doctor for over 30 years, I’ve never seen a pain-relief solution that works SO FAST… AND… gives you 24-hour LONG-LASTING RELIEF. So what is your “body clock”? It’s a 24-hour cycle our bodies go through every single day and it’s built into our DNA. But most importantly for you, your “body clock” controls your pain sensitivity. Then you need to simply reset your “body clock” starting as early as tonight. And just days from now, your joints could be so comfortable all day and night… you’d swear they were brand-new. And this means that your joints are too. And so do your joints. They have both a “day mode” and a “night mode”. This means your joints need specific nutrients during the day when you’re awake and different ones at night when you’re asleep. We’ll call them “day mode” nutrients and “night mode” nutrients. The main job of these specific daytime and nighttime nutrients is to keep your “body clock” running at top-notch performance 24/7. You are pain-free all day AND all-night long. YES! When your young grandchildren ask you to play with blocks and Legos on the floor. YES! When your spouse asks you to see the new Oscar-nominated film in the movie theater. YES! When your family asks you to join them at an amusement park this summer. Well, it’s because most ordinary joint treatments out there DON’T focus on BOTH “day mode” and “night mode”. Which is a HUGE problem, because your “night mode” is half, and arguably the most important part of your “body clock” cycle. Because it’s only during “night mode” that the all-important rebuilding phase takes place. And it’s only during those precious Zzzz’s that your cartilage in your joints can be rebuilt. And brand-new cartilage = brand-new joints. Because cartilage is the connective tissue in your body that cushions and lubricates your joints. It turns your worn-out, exhausted joints into brand-new, young-again, and most importantly, pain-free joints. But this can only happen when we sleep soundly and peacefully all night long. And I’m sure this sounds familiar, because great sleep is hard to come by. It probably takes you a lot longer to fall asleep now than it did 30 years ago… and I’m sure you wake up more often during the night… and spend much less time in a deep sleep. But the thing is, it’s not even as simple as getting 8 hours of sleep every night. After you spent a full day outside playing baseball with the neighborhood kids, you’d come home and hit the pillow hard, and you didn’t wake up until your mom yelled your name a few times to get up for school. And just because you haven’t slept like that in decades, that doesn’t mean that your body doesn’t need that same deep, rejuvenating slumber. This special kind of sleep is called slow-wave sleep. And it’s only during this slow-wave sleep that your “night mode” nutrients are able to rebuild and comfort your aching knees, tight hips, or locked up shoulders. And its main job is to stimulate the growth of our body’s connective tissue… including our cartilage in our joints. It’s like a much-needed rainfall after a few dry weeks in the heat of the summer. When the rain water hits your thirsty garden, your plants quickly gobble it up, allowing them to grow more and more vegetables. And just like the rainfall hitting your garden plants, the moment somatotropin reaches your knees, knuckles, and hips… it could begin re-growing your brand-new joints. So while you’re sleeping like a baby, your body’s working hard to make sure that you wake up pain-free. And you’ll never have to call your son to come over to change a light bulb for you. Plus, imagine… actually looking forward to doing the things you love again! Because when your joints are getting healthier and younger each day, your future is wide open! So start planning that family trip to a warm and sunny beach! But it’s important to remember that your brain only releases somatotropin during this special type of slow-wave sleep. That’s why you’ll NEED the #1 “night mode” nutrient, valerian. With valerian, you’ll fall into a restful, rejuvenating slow-wave sleep night after night. Because valerian has the unique ability to “switch off” your brain. It works just like your morning coffee… but in the opposite way. While caffeine gives the receptors in your brain the signal to wake up, valerian works by telling those same receptors to slow down, relax, and go to sleep. They got TRIPLE the amount of slow-wave sleep compared to the previous night. Plus, it took them HALF AS LONG to fall into a deep, peaceful sleep. They had 3X the opportunity to BUILD brand-new joints. And it started working the very first night. You could turn those restless, exhausting, uncomfortable nights into the most blissful, calming sleep you’ve had in years. Turning them back into those young-again knees, hips, elbows, or shoulders that you had 10, 15 or even 20 years ago. That’s why you need our next “night mode” nutrient, UC-II Collagen. This one-of-a-kind nutrient plays a key role in the rebirth of your joints. You see, most of the cartilage in our joints is filled with collagen, which keeps our joints flexible and smooth. But as we get older, our body produces less of the good, healthy collagen -- which in turn weakens the cartilage in our joints. But that’s where UC-II Collagen comes to the rescue. It increases the production of healthy collagen. So you get strong, young joints and long-lasting relief. And listen to this… it’s absolutely incredible! This special type of collagen went head to head in a study against glucosamine and chondroitin. At the end of this double-blind controlled study, all participants who received UC-II scored 3X higher than the glucosamine and chondroitin group showing improvement in movement, flexibility, and most importantly less pain. This means 3X better movement… 3X better flexibility and 3X LESS PAIN. This same study showed that UC-II is 240% MORE EFFECTIVE than glucosamine and chondroitin. 240% MORE RELIEF AND MORE COMFORT. Then you’ll start each day with pain-free knees and hips. I’m talking about your “day mode” nutrients. Their job is to help balance out inflammation, cushion all of those big and small movements, and keep you feeling good while you’re active all-day long. So you live completely pain-free 24-hours a day, 7 days a week. You’ll remain in pain for at least HALF of your 24-hour cycle. Do you want to spend each day suffering through relentless aches and pains? Or spend each night wide awake, tossing and turning all night long? That’s why you NEED to give your body the exact “day mode” nutrients and “night mode” nutrients it needs, when it needs it. So let’s make sure that when you wake up with those brand-new knees and hips… they stay pain-free all day long. Take your family to the zoo, walk through the entire park, and visit all of the exhibits. Meet your friends for an early lunch and a full day of shopping. Or take your dog for a long walk at the local park and then have your loved ones over that evening for a card game. To do all of these things, you need to feel loose, mobile, and flexible all day... and this starts with maintaining healthy levels of inflammation. That’s why as a medical doctor, I recommend starting each day with “day mode” nutrient, Boswellia. It’s been around for thousands of years, and was extremely valuable in ancient times. In fact, it was even given to baby Jesus as a gift because of its powerful healing capabilities. Back then, it was as valuable as gold. But today, it’s well-known for its ability to maintain healthy inflammation levels. It keeps you loose and limber by targeting 5-lipoxygenase, an enzyme that plays a key role in triggering your body’s inflammatory response. And lower levels of this enzyme can help reduce inflammation. It can even stop inflammation from spiking before it begins to cause you any pain or discomfort. Allowing you to live each day to the fullest and completely pain-free. All in just a SHORT 30 DAYS. Think of everything you’ll be able to do when your pain is almost CUT IN HALF. You could watch a doubleheader of your grandson’s baseball game without your knee “acting up”. You could spend all day running errands, jumping in and out of the car without cringing in discomfort. When your pain is almost CUT IN HALF, you’re going to feel like a new person. Giving you LONG-LASTING comfort and pain relief for many years to come. As long as you have Boswellia behind the wheel, your “day mode” joints will be working at optimal speed all day, every day. Spend your days doing the things you love, with the people you love… without aching knees slowing you down. Be the only person your age who can still mow your own lawn, rake leaves, and trim the bushes… all in the same day! Is this all starting to sound too good to be true? We just released a brand-new product from my team here at NorthStar Nutritionals -- America’s most trusted natural health company. It’s called Omni-Joint 24 -- with built-in “day mode” and “night mode” formulas for 24-hour joint comfort! And it’s the world’s FIRST and ONLY nutritional product designed specifically to reset your “body clock”. •“DAY MODE” SUPPORT with SolarFlex: Fighting inflammation and cushioning your movements to keep you active and on the move all day. •“NIGHT MODE” SUPPORT with LunaFlex PM: Helping you effortlessly fall asleep and stay asleep all while giving you the deep restful sleep your joints need to heal and rebuild. There’s never been ANYTHING like Omni-Joint 24… EVER. Two unique, powerful pain-relief formulas that work together in perfect unison to give you 24-hour joint protection and support. With Omni-Joint 24, you are completely covered around the clock, day AND night. And let your “body clock” do the rest! And after a few weeks, don’t be surprised if you feel like you’re living in a brand-new body! Feeling the 24-hour comfort and flexibility that Omni-Joint 24 provides! Are you starting to see how this product could change your life? It’s truly the ONLY joint product you’ll ever need -- because you’re getting full 24-hour coverage. Free to really enjoy life on YOUR terms. 200 mg of valerian and hops, which give you TRIPLE the amount of slow-wave sleep you need in order to grow brand-new joints while you sleep like a baby. UC-II Collagen which is 240% MORE EFFECTIVE than glucosamine and chondroitin reducing nighttime aches and pains. Boswellia which showed a 49% reduction in joint discomfort and 48% reduction in joint stiffness in only 30 days! Boron, which I like to call the “miracle nutrient”. It’s been shown to reduce joint discomfort and stiffness by 71%. And hyaluronic acid, supporting healthy levels of the soft, squishy gel that cushions your movements as you go about your day. I can’t wait for you to feel the life-changing effects of Omni-Joint 24. However, if you don’t have 10 seconds in the morning and 10 seconds in the evening to spare… in order to give yourself 24-hour pain relief, then Omni-Joint 24 is not for you. But if you have a total of 20 seconds per day then you can experience life-changing, all-day and all-night pain relief 24-hours a day, 7 days a week. Right now is absolutely the BEST time to try Omni-Joint 24, EVER. I mean that. Because this product is brand-new. This is the first time EVER that it’s been available to the public. However… it also means we only have an initial supply that is extremely limited. In fact, we are sending this invitation out to over 1 million readers, but we only have enough boxes to accept orders from 0.003% of all of you. That means that not even 1% of our readers will have the opportunity to place their order today. Which means we are virtually guaranteed to sell out. Just click the 'Add to cart' button to reserve your box of Omni-Joint 24 NOW — before it’s too late. I’d be surprised if we have any left by the end of today. But first, let’s get something out in the open. It’s easy to assume that Omni-Joint 24 would cost several hundred dollars a month. And to be honest, it would be a bargain at that price. If you think about it, how much would the feeling of a brand-new body be worth to you? But if you act quickly and are able to secure a risk-free box of this limited inventory you won’t pay anywhere near that. I think you’ll be both shocked and elated with the low introductory price you’ll find on our secure order form page. So click the 'Add to cart' button to learn how to claim your first box RISK-FREE. Each box of Omni-Joint 24 comes with a 100% Money Back Anytime Guarantee. You get back every penny of the purchase price. No questions, no hassles, and I’ll give you a prompt refund. And there’s no time limit on my guarantee -- whether it’s 3 months from now or 3 years down the road, you can always return your most recent order for a prompt and courteous refund. Some of our colleagues think we’re nuts to offer such a free and open money back promise. They think we’ll lose money or even get ripped off. Sending it back will be the furthest thing from your mind. So let’s not waste another minute, please click the 'Add to cart' button now to be taken to a secure order page where you’ll have the opportunity to order your first risk-free box. Plus, as an added benefit – just for you – your brand-new product comes with FREE SHIPPING when you become a member of our FREE Auto-Delivery Service. And with this FREE service, you are always guaranteed to have a box of Omni-Joint 24 reserved in your name even if we run out of inventory. As soon as you receive it in the mail, try it immediately and for as long as you like, knowing you are fully backed by our 100% Money Back Anytime Guarantee. At the end of 30 days, we will charge the credit card you used today and ship your next month’s refill of Omni-Joint 24. So you don’t have to go one day without the extraordinary benefits you’ll soon become accustomed to and unable to live without. And you’ll never have to pay for shipping again! If for any reason, you want to stop or change your refill cycle, please give us a quick call and we can make those changes for you. Why not think it over WHILE you try it, since you’re not risking a penny of the purchase price? Doesn’t it make sense to FEEL the results as a part of your decision-making process? And you won’t be one of the unlucky ones who tries to order after the last box is gone. It’s my medical opinion that it will be one of the best decisions you ever make. So go ahead, and click the 'Add to cart' button now to be taken to our secure order form. Thank you for your time today, I’m Dr. Allan Spreen.